I would like to take on the opportunity and invite you to the 5th Hungarian Climate Summit - "Water is Our Future" conference, organized by one of Hungary´s prominent NGO, the Climate Club. The aim of our organization is to actively contribute to the efforts in slowing down and minimizing the damages of the currently ongoing global climate change, to foster sustainability in economic and social development, and to help saving depleting water resources and the endangered species of wildlife and ecology. To effectively tackle the above seen challenges we are inviting together and promote open discussions and programs together with representatives of politics, key economic players, the energy sector, science, NGOs, and especially the youth generations. All our goals are shared by each of the groups and we are encouraging you to be part of it too. On the upcoming event, the 5th Hungarian Climate Summit so far unheard proposals, international bet practices will be shown in the field of sustainable development, water resources management and other up to date issues. I wish all of you an energetic, exciting and rewarding "Water is Our Future" conference! The Climate Club is a civil organization with a mission to actively get involved in tackling the global, and the ongoing urgent issues of climate change, to foster sustainable development, to help saving water reserves and the endangered species of animals, plants and other important parts of the ecosystem. In order to achieve this complex task the Climate Club is helping to establish dialogues and actions together with the different stakeholders, involving politicians, companies, scientists and civil organizations, the public and the media, with special attention to involve the young generations to increase their environmental consciousness, every day knowledge and to give them opportunity to be active participants in formulating the future. 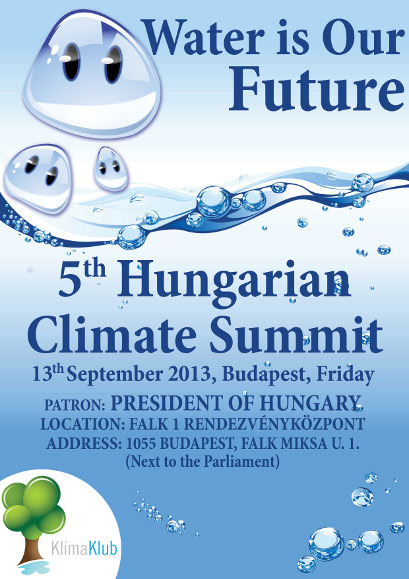 Between 2009 and 2012 the Climate Club has organized four Hungarian Climate Summits. 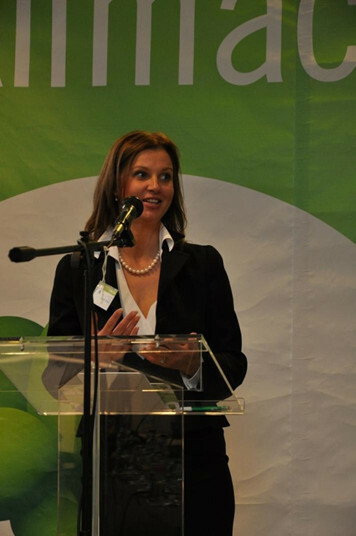 Main topics of the conferences have covered not only climate change and environmental protection, but also the different aspects of sustainable development, such as the role of energy sector and other industries, transportation, agriculture, politics, science and the civil society in fostering sustainable development. Among the invited speakers there were members of the Hungarian Government, EU Commissioners and other leading EU experts, members of the European Parliament and the Hungarian National Assembly dealing with environmental protection. Presentations were also given by members of the Hungarian Academy of Sciences, professors and researchers, ambassadors of EU member states in Budapest, civil organizations and CEO-s of major energy companies. All the events have invoked substantial Hungarian and foreign media attention.